B etween 2009 and 2012, Drs. 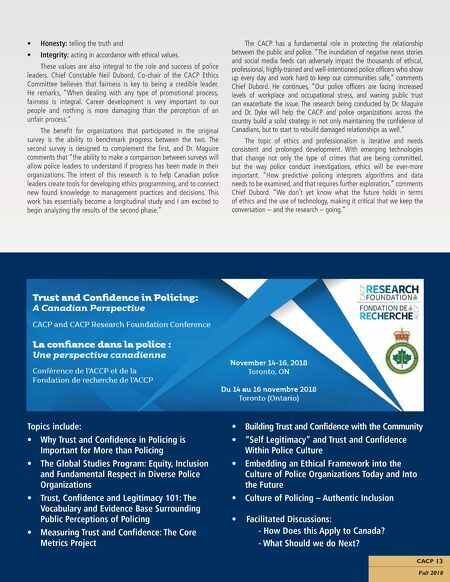 Stephen Maguire and Lorraine Dyke from Carleton University, in collaboration with the Canadian Association of Chiefs of Police, conducted research into ethics and professionalism in Canadian police agencies. The study, the first of its kind in Canada, surveyed over 10,000 police officers in 31 agencies. The purpose was to collect data on issues such as work environment, supervision, engagement, decision making, agency programs, and leadership practices so as to identify practices and programs positively correlated to professionalism. In the first study, Drs. 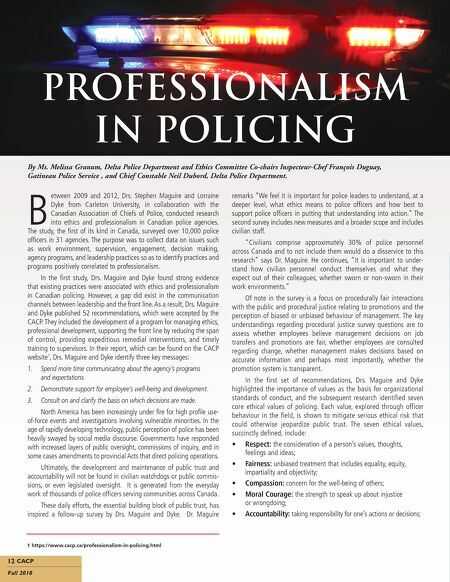 Maguire and Dyke found strong evidence that existing practices were associated with ethics and professionalism in Canadian policing. However, a gap did exist in the communication channels between leadership and the front line. As a result, Drs. Maguire and Dyke published 52 recommendations, which were accepted by the CACP. They included the development of a program for managing ethics, professional development, supporting the front line by reducing the span of control, providing expeditious remedial interventions, and timely training to supervisors. In their report, which can be found on the CACP website 1 , Drs. Maguire and Dyke identify three key messages: 1. Spend more time communicating about the agency's programs and expectations. 2. Demonstrate support for employee's well-being and development. 3. Consult on and clarify the basis on which decisions are made. North America has been increasingly under fire for high profile use- of-force events and investigations involving vulnerable minorities. In the age of rapidly developing technology, public perception of police has been heavily swayed by social media discourse. Governments have responded with increased layers of public oversight, commissions of inquiry, and in some cases amendments to provincial Acts that direct policing operations. Ultimately, the development and maintenance of public trust and accountability will not be found in civilian watchdogs or public commis- sions, or even legislated oversight. It is generated from the everyday work of thousands of police officers serving communities across Canada. These daily efforts, the essential building block of public trust, has inspired a follow-up survey by Drs. Maguire and Dyke. Dr. Maguire remarks "We feel it is important for police leaders to understand, at a deeper level, what ethics means to police officers and how best to support police officers in putting that understanding into action." The second survey includes new measures and a broader scope and includes civilian staff. "Civilians comprise approximately 30% of police personnel across Canada and to not include them would do a disservice to this research" says Dr. Maguire. He continues, "It is important to under- stand how civilian personnel conduct themselves and what they expect out of their colleagues, whether sworn or non-sworn in their work environments." Of note in the survey is a focus on procedurally fair interactions with the public and procedural justice relating to promotions and the perception of biased or unbiased behaviour of management. The key understandings regarding procedural justice survey questions are to assess whether employees believe management decisions on job transfers and promotions are fair, whether employees are consulted regarding change, whether management makes decisions based on accurate information and perhaps most importantly, whether the promotion system is transparent. In the first set of recommendations, Drs. Maguire and Dyke highlighted the importance of values as the basis for organizational standards of conduct, and the subsequent research identified seven core ethical values of policing. Each value, explored through officer behaviour in the field, is shown to mitigate serious ethical risk that could otherwise jeopardize public trust. The seven ethical values, succinctly defined, include: • Respect: the consideration of a person's values, thoughts, feelings and ideas; • Fairness: unbiased treatment that includes equality, equity, impartiality and objectivity; • Compassion: concern for the well-being of others; • Moral Courage: the strength to speak up about injustice or wrongdoing; • Accountability: taking responsibility for one's actions or decisions; 12 CACP Fall 2018 Professionalism in Policing 1 https://www.cacp.ca/professionalism-in-policing.html By Ms. Melissa Granum, Delta Police Department and Ethics Committee Co-chairs Inspecteur-Chef François Duguay, Gatineau Police Service , and Chief Constable Neil Dubord, Delta Police Department.